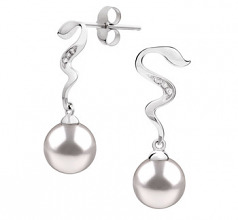 The perfect 8-9mm sized Japanese Akoya Pearl dangles from the 1” 14K White Gold spiraled earring. 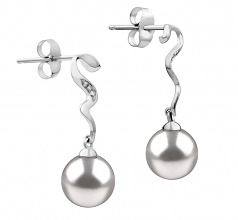 The near perfect shape of the fine pearl swirls with each movement. Its elegance and dazzling desire is clearly seen in the six diamonds accent (.02 ct) that leads into the (AAAA) luster and all the sparkling delight. The White 8-9mm AAA Quality Japanese Akoya 14K White Gold Pearl Earring Set stays true to any wardrobe set and can create some of the most magnificent combinations all with the simple addition of something so wonderful.